#Blackout Protest against SOPA really works and the result is now in front of us. The US Congress has halted debate on two contested anti-online piracy bills. In a statement Senate Majority Leader Harry Reid said "In light of recent events, I have decided to postpone Tuesday's vote on the PROTECT IP Act,"
Chairman Smith: “I have heard from the critics and I take seriously their concerns regarding proposed legislation to address the problem of online piracy. It is clear that we need to revisit the approach on how best to address the problem of foreign thieves that steal and sell American inventions and products. The problem of online piracy is too big to ignore. American intellectual property industries provide 19 million high-paying jobs and account for more than 60 percent of U.S. exports. The theft of America’s intellectual property costs the U.S. economy more than $100 billion annually and results in the loss of thousands of American jobs. Congress cannot stand by and do nothing while American innovators and job creators are under attack." Actually they are forced to take this decision as because the mass did not at all welcome these acts. Not only Anonymous but also Wikipedia, The White House and many other sites opposed to see 'Censored web'. 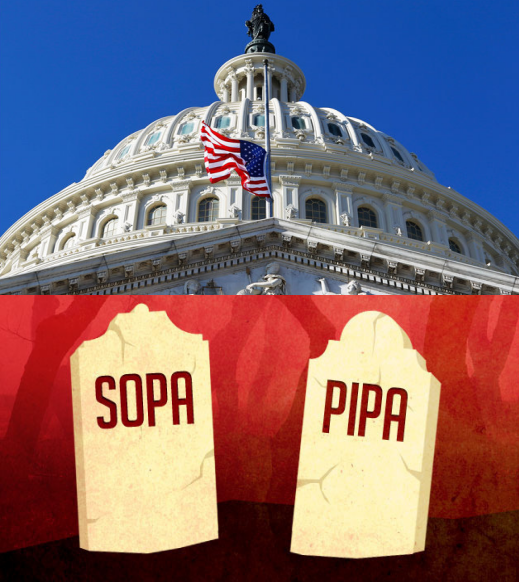 So US Congress is forced to delayed those two controversial bills. This is indeed a big win for those who stand against SOPA/PIPA.